Pie is a classic American dessert, what guy doesn’t like a fat slice of juicy pie? 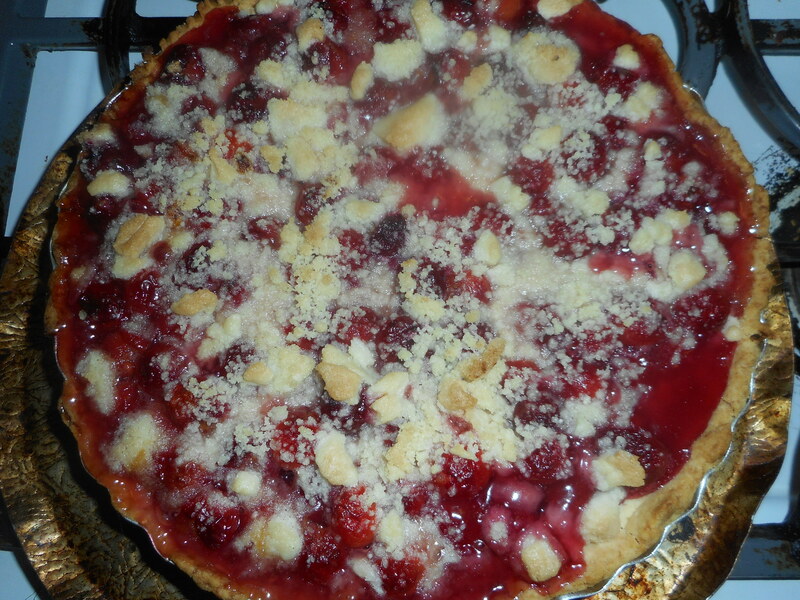 Cherry pie is perfect for the weeks before and after the Fourth of July or anytime you can get frozen sour cherries. 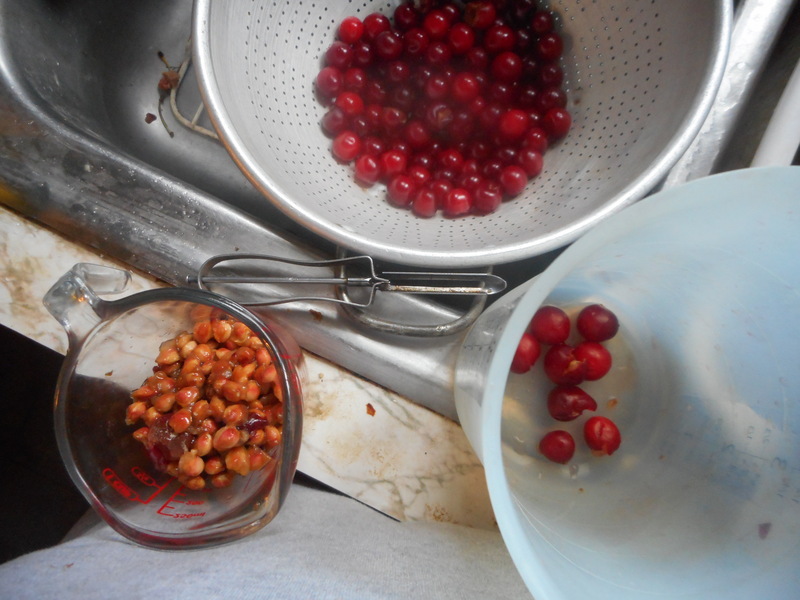 My sister sometimes uses jarred cherries but I prefer fresh or frozen sours. 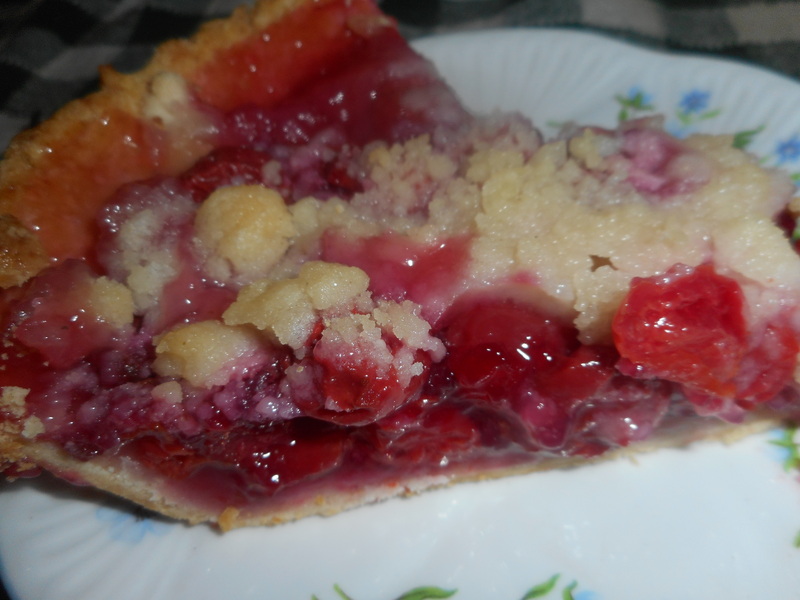 You can make it gf easily with this recipe – this crust is really tasty; my family practically cheers when I serve homemade gf pie and they don’t eat gluten free. Another option is to buy a ready made unbaked crust and just use my crumb topping on it; very easy way to make a homemade pie. Fresh tasting, locally sourced fruits are exactly in the spirit of summer. I picked mine at an orchard down in Bucks County near the Turnpike along Limekiln Pike, about 20 minutes from Hellertown. I hear Bechdolts Orchard has sour cherries too. The sugar, cinnamon and almond extract combine to create an intense cherry flavor. 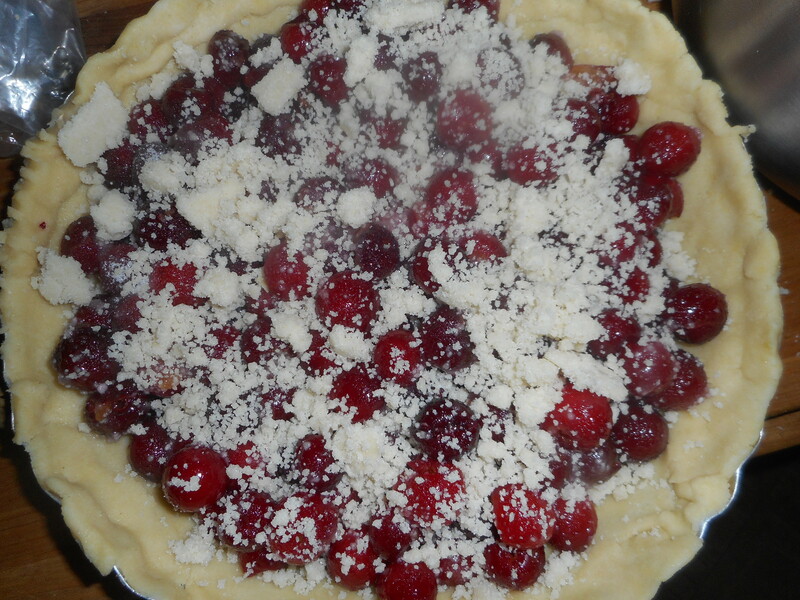 If you prefer a lattice it can be made by doubling this pie crust and some careful construction work. I tend to go the easy route of the crumb as everyone loves it. 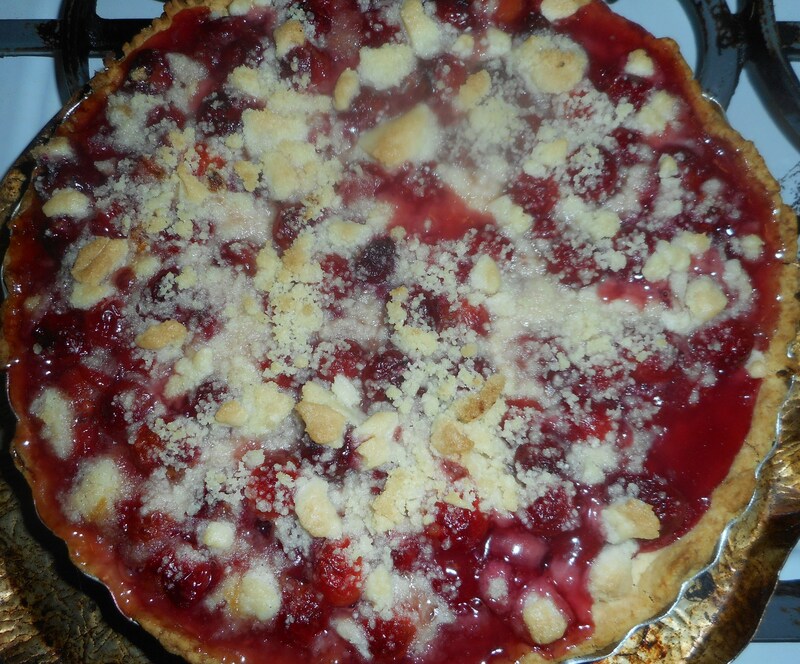 You could make a smaller 8 inch pie; use a cup less fruit and cut the sugar some, ditto for the tapioca. If you ate tapioca you can use white rice flour instead. I baked mine on a pie ring that captures overflow juices; this is one juicy pie! This pie is fantastic with a scoop of vanilla ice cream on the side. Directions: Roll out the pie crust between two sheets of wax paper or in a pie bag; try to get the thickness even, no thick middle! Peel off one side of paper and place in pie pan, centered. Remove other slice of wax paper. Crimp edges all around. Fill with sweetened fruit mix. Sprinkle the crumb topping (1 to 1½ cup) evenly over this mixture. The more crumbs the thicker the crust they will form; for a really thick crust use all the crumbs from the recipe below. Bake in a preheated 375 degree oven for 30 minutes with a piece of aluminum foil on top of the pie, then 15-20 more minutes uncovered until bubbly and the crust is light brown. Cool at least 2 hours before serving at room temperature.